Now you can grow two family favourite cherry varieties from one tree - space saving and easy to grow! Stella Cherry and Morello Cherry have both been grafted on to the same tree! This novelty and compact tree will reward you with pounds of delicious sweet and cooking cherries for years to come. Supplied as a bare root, grower quality tree, grafted on a single rootstock with 2 cherry varieties. Cherry Stella. 'Stella' Cherry is 'Self-Fertile' (which means it does not need a second variety of cherry tree to pollinate it) and is a really heavy, reliable cropper because it has good resistance to late frosts. Unlike most other sweet cherry varieties, it will thrive in slightly exposed locations but can also be grown in a pot on your patio. The sweetly flavoured dark-skinned, plump and juicy, aromatic fruits will be ready to pick from mid late July each year and from the third growing season onwards you can expect upwards of 5kg (11lbs) of sweet fruits per tree, which will save a small fortune compared to paying supermarket prices! Morello Cherry. 'Morello' Cherry is often referred to as 'The Cooking Cherry' because it is the variety most frequently used for making the delicious fragrant pies and jams we all know and love! The fruits are packed with juice and the skin colour is dark red. It is one of the most reliable croppers of all the sour cherries because it is self-fertile, late flowering and so less susceptible to frost damage, plus it is incredibly disease resistant - a real winner for any garden! 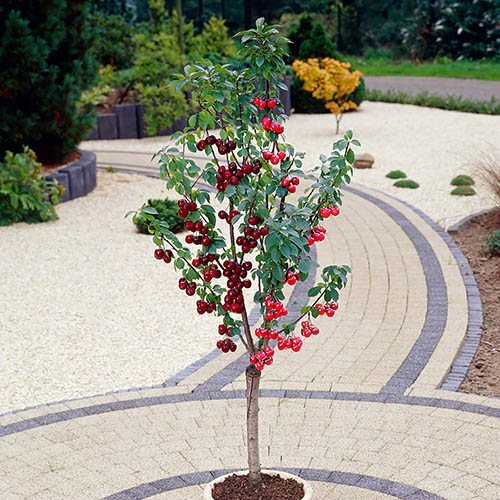 'Morello' Cherry is also a great tree to grow on a north-facing wall because even in a cooler position with low light levels it will still grow and thrive and fruit as normal. You can usually expect to pick the fruits from late August onwards. Firm in the soil with your heel, avoiding the root ball, water well.